Lake of Bay Brewing Company is proud to announce the launch of Top Shelf Classic Lager, the official beer of the NHL Alumni Association, in early October. 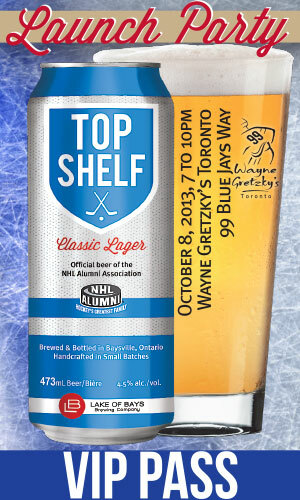 YOU can win two VIP passes to the launch party, taking place at Wayne Gretzky's in Toronto on October 8. All you have to do is email them, with a picture, at TopShelf@LakeofBaysBrewing.ca, and tell them Why You Absolutely Have To Be There. They'll post your entries on Facebook, Twitter, Pinterest and our other social media. Contest closes at 5:00pm on Monday September 30, 2013. They'll select five winners of two passes each and announce them on October 2, 2013. Don't forget to check everyone's entries on their Facebook, Twitter and Pinterest pages. An American-style lager with 4.5% alc./vol., Top Shelf is craft brewed in small batches in Baysville Ontario, using top quality noble hops and Canadian malt. Top Shelf will be available at the LCBO and at selected pubs and restaurants in Ontario starting in early October. The company plans to distribute to other Canadian provinces and to parts of the United States later this year.